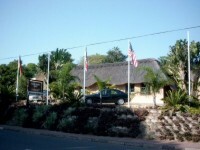 St. Lucia South Africa Central Reservations - Accommodation. The Greater St.Lucia Wetland Park. The greatest fear of all tourists is not that they have to venture into vast, unknown areas [ for most this is part of the adrenaline rush of traveling ] but mostly that they do not know what to expect regarding the places they will accommodated in. Although the seasoned tourist is prepared to accept reasonable standards of accommodation, the criteria of value for money and in a sense "a home away from home" always prevails. In St. Lucia and the Greater St. Lucia Wetland Park area a large variety of accommodation is available in the tourism market. it must be borne in mind that to the larger extent these accommodation facilities originally developed from the domestic tourism trade whereby the standards of such are not always to the expectation of the international traveler. Ever felt having been misled by carefully constructed advertisements and when you arrive at the venue you feel very disappointed? Allow us at St. Lucia Central Reservations to be your guide in this matter as we have 10 years of experience in what the various establishments in St. Lucia and the Greater St. Lucia Wetland Park area really have to offer. As most of the establishments are not subject to or subscribe to authority standards, the classifications on the left were devised by us to assist the tourist not only to budget for his travels but in the main to ensure that the tourist has a reasonable idea of what to expect from the various establishments on arrival. ** Standards with individual facilities or units may vary from time-to-time depending on the management or ownership.